I've posted this analysis to Debian mailing lists already, but I'm thinking it's also useful as a blog post too. I've also fixed a few typos and added a few more details that people have suggested. I promised way back before DebConf 18 last August that I'd publish the results of the rebuilds that I'd just started. Here they are, after a few false starts. I've been rebuilding the archive specifically to check if we would have any problems building our 32-bit Arm ports (armel and armhf) using 64-bit arm64 hardware. I might have found other issues too, but that was my goal. for automated analysis of the build logs that I've used as the basis for the stats below. As far as I can see we're basically fine to use arm64 hosts for building armel and armhf, so long as those hosts include hardware support for the 32-bit A32 instruction set. As I've mentioned before, that's not a given on all arm64 machines, but there are sufficient machine types available that I think we should be fine. There are a couple of things we need to do in terms of setup - see Machine configuration below. I (naively) just attempted to rebuild all the source packages in unstable main, at first using pbuilder to control the build process and then later using sbuild instead. I didn't think to check on the stated architectures listed for the source packages, which was a mistake - I would do it differently if redoing this test. That will have contributed quite a large number of failures in the stats below, but I believe I have accounted for them in my analysis. using my local mirror for improved performance when fetching build-deps etc. I started off with a fixed list of packages that were in unstable when I started each rebuild, for the sake of simplicity. That's one reason why I have two different numbers of source packages attempted for each arch below. If packages failed due to no longer being available, I simply re-queued using the latest version in unstable at that point. I then developed a script to scan the logs of failed builds to pick up on patterns that matched with obvious causes. Once that was done, I worked through all the failures to (a) verify those patterns, and (b) identify any other failures. I've classified many of the failures to make sense of the results. I've also scanned the Debian BTS for existing bugs matching my failed builds (and linked to them), or filed new bugs where I could not find matches. I did not investigate fully every build failure. For example, where a package has never been built before on armel or armhf and failed here I simply noted that fact. Many of those are probably real bugs, but beyond the scope of my testing. Quite a number of go packages are blindly assuming sizes for 64-bit hosts. That's probably fair, but seems unfortunate. I was using quite a generous timeout (12h) with sbuild, but still a very small number of packages failed. I'd earlier abandoned pbuilder for sbuild as I could not get it to behave sensibly with timeouts. Considering the number of package builds here, I think these numbers are basically "lost in the noise". I have found so few issues that we should just go ahead. The vast majority of the failures I found were either already known in the BTS (260), unrelated to what I was looking for, or both. See below for more details about build host configuration for armel builds. FTAOD: I attempted fewer package builds for armhf as we simply had a smaller number of packages when I started that rebuild. A few weeks later, it seems we had a few hundred more source packages for the armel rebuild. 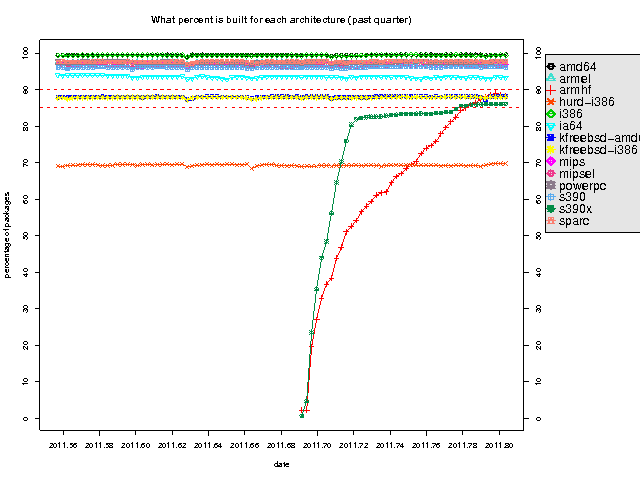 The armhf rebuild showed broadly the same percentage of failures, if you take into account the nodejs difference - it exists in the armhf archive, so many hundreds more packages could build using it. That's the same as for armel, I'm assuming (without checking!) that they're the same packages. Again, these small numbers tell me that we're fine. I liked to 139 existing bugs in the BTS here. To be able to support 32-bit builds on arm64 hardware, there are a few specific hardware support issues to consider. Our 32-bit Arm kernels are configured to fix up userspace alignment faults, which hides lazy programming at the cost of a (sometimes massive) slowdown in performance when this fixup is triggered. The arm64 kernel cannot be configured to do this - if a userspace program triggers an alignment exception, it will simply be handed a SIGBUS by the kernel. This was one of the main things I was looking for in my rebuild, common to both armel and armhf. In the end, I only found a very small number of problems. Given that, I think we should immediately turn off the alignment fixups on our existing 32-bit Arm buildd machines. Let's flush out any more problems early, and I don't expect to see many. To give credit here: Ubuntu have been using arm64 machines for building 32-bit Arm packages for a while now, and have already been filing bugs with patches which will have helped reduce this problem. Thanks! Again, there is quite a performance cost to enabling emulation support for these instructions but it is at least possible! In my initial testing for rebuilding armhf only, I did not enable either of these emulations. I was then finding lots of "Illegal Instruction" crashes due to CP15 barrier usage in armhf Haskell and Mono programs. This suggests that maybe(?) the baseline architecture in these toolchains is incorrectly set to target ARMv6 rather than ARMv7. That should be fixed and all those packages rebuilt at some point. Peter Green pointed out that ghc in Debian armhf is definitely configured for ARMv7, so maybe there is a deeper problem. Edmund Grimley Evans suggests that the Haskell problem is coming from how it drives LLVM, linking to #864847 that he filed in 2017. In the glibc build, we found an arm64 kernel bug (#904385) which has since been fixed upstream thanks to Will Deacon at Arm. I've backported the fix for the 4.9-stable kernel branch, so the fix will be in our Stretch kernels soon. There's something really weird happening with Vim (#917859). It FTBFS for me with an odd test failure for both armel-on-arm64 and armhf-on-arm64 using sbuild, but in a porter box chroot or directly on my hardware using debuild it works just fine. Confusing! I've filed quite a number of bugs over the last few weeks. Many are generic new FTBFS reports for old packages that haven't been rebuilt in a while, and some of them look un-maintained. However, quite a few of my bugs are arch-specific ones in better-maintained packages and several have already had responses from maintainers or have already been fixed. Yay! Yesterday, I filed a slew of identical-looking reports for packages using MPI and all failing tests. It seems that we have a real problem hitting openmpi-based packages across the archive at the moment (#918157 in libpmix2). I'm going to verify that on my systems shortly. So far in Debian, we've tended to run our build machines using chroots on raw hardware. We have a few builders (x86, arm64) configured as VMs on larger hosts, but as far as I can see that's the exception so far. I know that OpenSUSE and Fedora are both building using VMs, and for our Arm ports now we have more powerful arm64 hosts available it's probably the way we should go here. In testing using "linux32" chroots on native hardware, I was explicitly looking to find problems in native architecture support. In the case of alignment problems, they could be readily "fixed up / hidden" (delete as appropriate!) by building using 32-bit guest kernels with fixups enabled. If I'd found lots of those, that would be a safer way to proceed than instantly filing lots of release-critical FTBFS bugs. However, given the small number of problems found I'm not convinced it's worth worrying about. Another related issue is in how we choose to slice up build machines. Many packages will build very well in parallel, and that's great if you have something like the Synquacer with many small/slow cores. However, not all our packages work so well and I found that many are still resolutely chugging through long build/test processes in single threads. I experimented a little with my config during the rebuilds and what seemed to work best for throughput was kicking off one build per 4 cores on the machines I was using. That seems to match up with what the Fedora folks are doing (thanks to hrw for the link!). As I mentioned earlier, to build armel and armhf sanely on arm64 hardware, we need to be using arm64 machines that include native support for the 32-bit A32 instruction set. While we have lots of those around at the moment, some newer/bigger arm64 server platforms that I've seen announced do not include it. (See an older mail from me for more details. We'll need to be careful about this going forwards and keep using (at least) some machines with A32. Maybe we'll migrate arm64-only builds onto newer/bigger A64-only machines and keep the older machines for armel/armhf if that becomes a problem? I've spent a lot of time looking at existing FTBFS bugs over the last weeks, to compare results against what I've been seeing in my build logs. Much kudos to people who have been finding and filing those bugs ahead of me, in particular Adrian Bunk and Matthias Klose who have filed many such bugs. Also thanks to Helmut Grohne for his script to pull down a summary of FTBFS bugs from UDD - that saved many hours of effort! Please let me know if you think you've found a problem in what I've done, or how I've analysed the results here. I still have my machines set up for easy rebuilds, so reproducing things and testing fixes is quite easy - just ask! As shipped, Debian Jessie (8.0) did not include kernel support for the USB controller on APM X-Gene based machines like the Mustang. In fact, at the time of writing this that support has not yet gone upstream into the mainline Linux kernel either but patches have been posted by Mark Langsdorf from Red Hat. This means that installing Debian is more awkward than it could be on these machines. They don't have optical drives fitted normally, so the neat isohybrid CD images that we have made in Debian so far won't work very well at all. Booting via UEFI from a USB stick will work, but then the installer won't be able to read from the USB stick at all and you're stuck. :-( The best way so far for installing Debian is to do a network installation using tftp etc. I've patched the Debian Jessie kernel, then re-built the installer and a netinst image to use them. I've put a copy of that image up at http://cdimage.debian.org/cdimage/unofficial/arm64-mustang/ with more instructions on how to use it. I'm just submitting the patch for inclusion into the Jessie stable kernel, hopefully ready to go into the 8.1 point release. As a follow-up to my post about bootstrapping arm64 in Debian, we've had more hardware given to Debian for us to use in porting and building packages for arm64. Applied Micro sent me an X-Gene development machine to set up and use. Unfortunately, the timing was unlucky and the machine sat on my desk unopened for a few weeks while I was on long holiday in Australia. Once I was back, I connected it up and got it working. Out of the box, a standard Jessie arm64 installation worked using network boot (dhcp and tftp). I ran through d-i as normal and installed a working system, then handed it over to the DSA and buildd folks to get the machine integrated into our systems. Easy! The machine is now up and running as arm-arm-03.debian.org and has been building packages for a few weeks now. You can see the stats here on the buildd.debian.org site. Thanks to APM for their generous donation here, and particularly to Richard Zenkert for his help in getting this machine shipped to us. Back in September, I wrote about the machines that I set up to help bootstrap the new armhf port in Debian. Basing on Konstantinos' huge efforts in bringing up the new "architecture" in debian-ports, we started importing armhf into the main Debian archive on the 24th of November. Since then, those builders have been churning away night and day to build the huge collection of software that makes up the Debian archive. 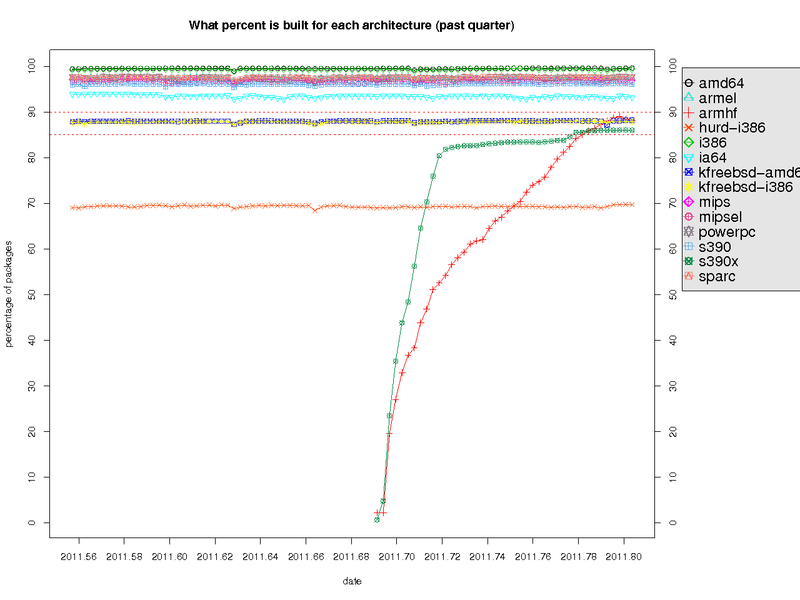 The current state can be seen on the armhf buildd status page, and there's a nice graph showing how quickly we've managed to run from 0 to over 90% of the archive here. (Click on the image for a larger version, or visit https://buildd.debian.org/stats/ for other versions. We overtook hurd-i386 quickly and are now ahead of the kfreebsd-* architectures. We've recently brought 3 more similar build machines online (hildegard, howells and hummel), again sponsored by the nice folks at Linaro but now hosted at the York NeuroImaging Centre at the University of York. This gives us both more build horsepower to keep up with building more different bits of Debian (experimental, updates etc.) and more redundancy in case of problems. We now have the vast majority of the archive built, and now a number of us are concentrating on fixing the remaining issues: language bootstraps and bugs. Also, on the 7th of January we were just added into testing, the next step on our path for inclusion as a Debian release architecture. A lot of people have been asking me about the physical setup I showed in my last blog about these machines, so here's more details for those who are interested. Schroff model 24563-192 subrack (3U, 235mm deep), ordered from Farnell in the UK. Added some 24560-353 220mm guide rails (Farnell link). Lovely kit, which fits together easily for a rigid enclosure. Ideally with lots of old-style Molex power connectors. I bought the cheapest one I could find from my supplier, and dismantled it. I cannibalised another old PSU and soldered on some extra Molex connectors. In theory, the 6 boards and disks I'm using here could use up to 15W each on the 5V rail (but in practice much less); any current PSU on the market should handle that easily. While I had the case open, I drilled holes and put some bolts through so I could mount it to the mini-rack. Finally, connect together pins 15 and 16 on the ATX power connector so that the PSU will come on without needing to be connected to a PC motherboard (details on wikipedia). These are the little 3-inch square dev boards I'm using. I bought them from Mouser here, but there are quite a few other companies selling them too. Apparently this exact part has just gone EOL, but there is a replacement that I would hope to work in its place. I just bought what looked reasonably priced from my local supplier, 320 GB on the first machines and 250 GB on the next three after the recent rise in disk prices. The downside of the Quickstart board is that it doesn't include a SATA power connector on the board, just a SATA data connector. So, what I've done for my boards is modify Molex to SATA power splitters. This way I get a single power input for the board/drive combination as a whole. I found a supplier near Cambridge for some perspex. Each machine has a base card measuring 220mm x 100mm, 2mm thick. I drilled holes and mounted each board with a drive and its cables as shown here. 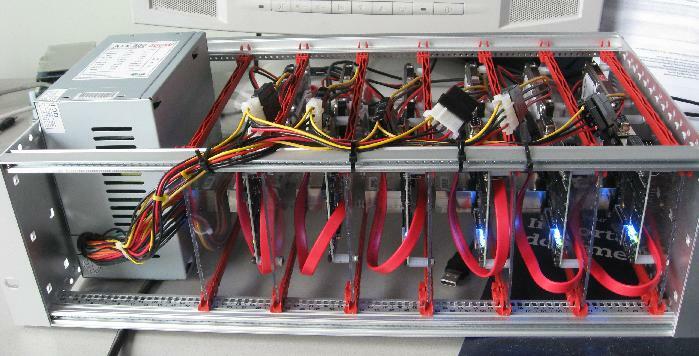 Mount the 6 boards into the mini-rack, connect up the Molex power connectors to each board, attach ethernet cables and turn it all on! Each board comes with a micro-SD card containing uboot and an Ubuntu installation. I've configured uboot to boot off the hard drive directly, but leaving configuration available to use the Ubuntu on the micro-SD as a simple rescue system should the need arise. UPDATE 2012-01-12: Ian tells me that the newer Quickstart-R boards apparently have a different power controller; these now boot up straight away without needing you to push a button. That sounds useful. All of these machines are Freescale i.MX53 Quickstart (aka "loco") development boards. They include a 1GHz i.MX53 CPU (based around the ARM Cortex A8, one of the ARMv7-A family). They have 1GB of RAM and native SATA. They're lovely little machines, measuring just 3 inches square. To mount them usefully in a machine room, I've mounted each board with a 320GB notebook hard drive and the necessary cabling onto a small perspex card as you can see here. Then we can fit 6 such machines and a normal PC-style ATX PSU into a 3U mini-rack. Well, it almost fits - the power supply pokes out a little so we'll need 4U of space when we come to mount it. The Quickstart boards have been sponsored by Linaro, and ditto my time setting up these machines. Thanks! Need to make sure that depmod is run so the new kernel can find and load modules at boot. Added trivial script in /etc/kernel/postinst.d/depmod to do this. Needed to copy the file /etc/kernel/postinst.d/initramfs-tools into place from my amd64 machine; I'm guessing this would be there automatically on a new-enough version of initramfs-tools on the armel machines, but we're still using Lenny as a base system for now even if I'm using a Squeeze-based kernel. #550584: kernel postinst hook script (/etc/kernel/postinst.d/zz-flash-kernel) to create uImage and uInitrd files from the kernel zImage and the initramfs. All of these machines are Marvell DB-78x00-BP development boards, each configured with a 1GHz Feroceon processor (ARM v5t), 1.5GB of RAM and a 250GB drive attached via SATA. They're nice machines, reasonably powerful yet (as with many ARM-based machines) they draw very very little electrical power even when working hard. 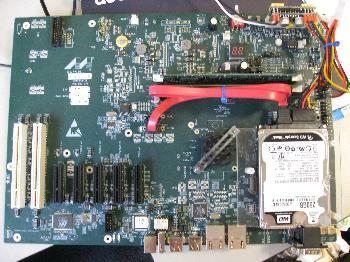 These very boards were used for a while by the folks at Canonical to help build the Ubuntu armel port, but now we've got them. In terms of configuration, these machines are not quite fully supported in Debian yet, though. The kernels we're using are locally-built, based on the Debian linux-source-2.6.32 package but with a .config (marvell.config) that's tweaked slightly to add the support for these boards. There aren't any source changes needed, so I'm hoping to get support added directly in Debian, either as a new kernel flavour or (preferred) as a patch to an existing flavour. I've had conflicting advice about whether the latter is possible, so I'm going to have to experiment and find out for myself. Annoyingly, that wouldn't work when cross-compiling either so I had to build the kernel natively. #594878: support for these boards. Hector did most of the work, and I've worked on it a little more. And that's it, as far as I can see.